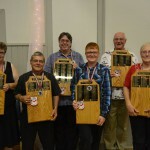 The 2015 Canadian Horseshoe Pitching Championships were held from August 11-15 at Garcelon Civic Center in St.Stephen, New Brunswick. Located on the St. Croix River, a natural border between St. Stephen and Calais, Maine, it is one of the smallest communities ever to host the event. Not even 10 years old, the St. Stephen Horseshoe Pitchers Club, founded in 2006, has grown to become the largest club in the Maritimes. 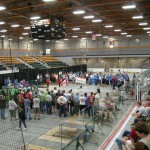 This was the third time that the championships were held in New Brunswick (Saint John was host in 1997 and 2003). 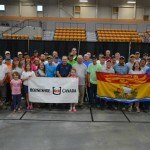 In 2015, there were a total of 210 entries from 8 provinces represented as follows: Ontario (64), New Brunswick (48), Quebec (46), Alberta (19), Saskatchewan (16), Nova Scotia (9), B.C. (6) and P.E.I. (2). 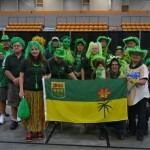 A meet & greet was held after Horseshoe Canada’s Annual General Meeting on Tuesday August 11th. The competition was launched the next day with the opening ceremonies where 90 year old Earle Fraser tossed the first ceremonial shoes. In the Men’s division, Quebec’s Andre Leclerc (67.75%) won his 9th title after a long wait of 20 years (his previous win was in 1995). He remained undefeated, a first among his 9 titles, to edge defending champion Colin Finnie. His win was confirmed when he defeated Paul Blais with 2 rounds to go. Ironically, both played against each other in the first Quebec Provincials for Juniors back in 1977. In St.Stephen they met in championship play for the first time since their junior years! Andre and Simon Cote had 12 fourdeads in their 68-shoe game which is probably a tournament high. 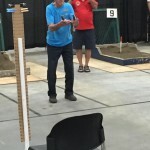 In the Women’s division, Sylvianne Moisan, after being undefeated for a few years, lost 3 games, but came back to beat defending champion Jane Cordingley in the last round and in the playoff that ensued. She won her 17th title (an emotional one) helped by the high average of all the participants (68.77) and high game (85.7%). Lyne Pineault, who stopped Sylvianne’s winning streak completed the podium. Jean-Guy Trudel (65.41%) became the first player from Quebec to capture the Elders national title. He defeated Jean Kenney in the last round to avoid a playoff with Jean. Alvin Nanninga finished third in this strong group of competitors. Stan Leis (42.94%) retained his Senior Men’s title by edging Frank Weaver in a close playoff game. Michel Forget finished third, one game behind the leaders completing an all-Ontario podium. Stan and Frank have been exchanging this title in the last 5 years. Clara Allard (50.31%) won her first Senior Ladies title, becoming the third woman from Saskatchewan to do so, but the first since 1998. In the Junior division, Cedryk Weightman also became the third player from his province to capture that title, but the first since 1985 (Patrick Bergeron, who his still active today, was champion 30 years ago). Cedryk remained undefeated and averaged 56.8% overall. Mike Marshall took second place, followed by Dalton Thomas. Ontario’s Connor Brown is the new Cadets champion. Despite his impressive average of 31.78%, runner-up Hannah Borthwick came one ringer short of being crowned champion in that category. 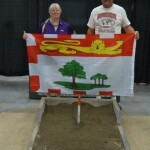 She would have been New Brunswick’s second Canadian champion (George Barton won the Elders division in 2003). Alberta’s Emily Stevenson completed the podium. Overall, there were 36452 “ringers by the river” (the slogan of the championships) out of 119 182 shoes pitched. 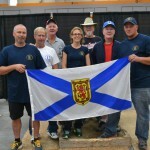 A total of 30 gold medals were awarded and 11 of them were won by Ontarians, followed by New Brunswick with 9 first place finishes. Media coverage was excellent this year with at least 3 TV reports aired on CBC, CTV and Global. Thanks to Horseshoe Canada, the participants, our hosts, their sponsors and volunteers for another great event! Looking forward to seeing you in Victoria, B.C. 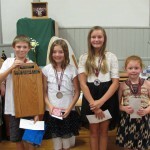 in 2016.The banquet, held at the Masonic Hall, concluded the championships on Saturday August 15th. 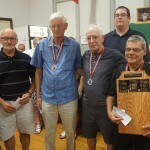 Tom Gallina was inducted into the Horseshoe Canada Hall of Fame as an outstanding male player. According to the tradition, the “Silver Shoe” is passed from the present year host Club to the Club hosting the Canadian Championships the following year. Victoria will be hosting thee Championships in 2016. 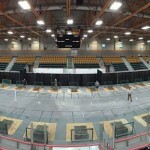 Overall view of the court set-up. Erle Fraser throwing the opening shoes. Three generations. 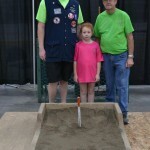 Claire Rideout was the youngest participant. PEI’s first participants in many years: Trena and David MacLean. 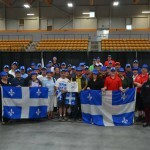 One of the largest groups of Quebec participants ever. The Cadets group at the banquet. Elders top 4: Leo-Paul, Alvin, Jean et Jean-Guy.